Ola and I spent part of Saturday at the 2006 Orchid Festival at Kew Gardens. 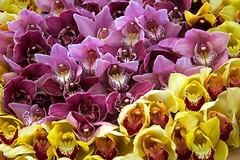 The theme was Orchids in Art and Design. Wonderful displays. There were several large (probably 8ft tall) paintbrushes where the ends were covered in colourful orchids as if covered in paint, and some artist's palettes with the blobs of paint made up of orchid displays. The exhibition ends today, so we just caught the end of it... but it turns out that it is an annual event, so I'm sure we'll visit again next year. A great opportunity to make use of some of the techniques in Photographing Plants and Flowers. Apparently one of the best ways to capture the unique shape of orchids is to face them, and then position the camera at about 45 degrees to the side, and 45 degrees up or down. Seemed to work well. And so begins the last week of my 20s. Sigh.